Up with Referrals! Down with Word-of-Mouth. Be deliberate, not random, with contacts in your network. You keep in touch with industry colleagues, current or former clients and business contacts, among others. You’ve worked to establish and maintain relationships with all of them. They subscribe to your newsletter; they serve on a committee with you; you see them periodically at events. You even comment on their posts on LinkedIn and Twitter. All to stay top of mind for that next referral. For example, at Claudine’s suggestion, you met with Bernadette a few months ago. Bernie is on the board of a family-owned company. She mentioned your services to the other directors and the company has hired you. Congratulations! Give yourself the credit you deserve. That is a referral from your network. That is not word-of-mouth. 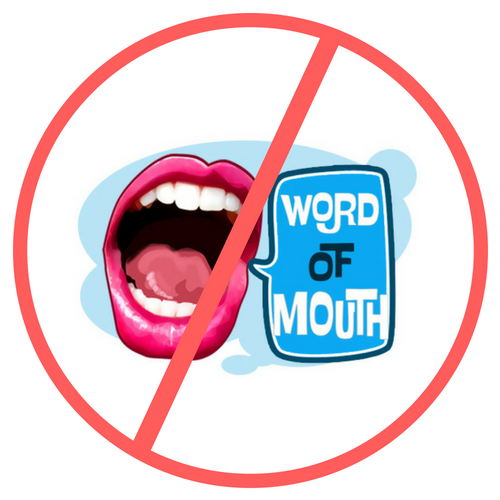 Labeling that new business word-of-mouth degrades it, in my view. This new client did not materialize out of thin air on your doorstep in some random fashion. This project is not a gift from the universe. You made a connection and you earned the project. Trace the steps that led to this new assignment. Next, reinforce the process with an appropriate acknowledgment to the intermediate contact(s) who facilitated it. For example, I invite the referral source to lunch, so we may become better acquainted away from our phones. As for the referrer who lives in another city, a gift card to a well-known retailer is always welcome. Now, during the slow summer season, take a closer look at your network and re-invigorate your connections, especially those who are potential referral sources. Then, classify them by priority, in terms of the strength of your relationship. Set a calendar to daily call FIVE people by phone. In that conversation of five or ten minutes, learn what is new in their world. Listen, without self-promotion or sales talk. After you set a date to meet or resume your chat, you can check that name as complete and move on to the next person. What do you say to these dormant contacts? Write a script: use these prompts to get started, then ask for a conversation of five or ten minutes to catch up. Your name came to mind in a review of contacts. The news about _____ reminded me of you. Someone asked me about a _______ professional, so I thought of you. An article about _______ made me think of you. According to LinkedIn, you are now (at new company) (in new role). Congratulations! Keep yourself visible and you will be the preferred source for that network contact and the many people in their network. Consider: there is a new project that you could manage and someone is going to get it. Business does not go away; it goes to someone else who was top-of-mind. Be proactive and referrals, not word-of-mouth, will lead to your success. Best practice in leaving a phone number. When the contact is not available, leave a voice message according to a variation on your script. Be sure to mention that you are in the office today and tomorrow and you would love to hear from them. Write your phone number as words – two one two, six seven seven, five seven seven zero – and then slowly read it. This method will keep you from reciting the number faster than someone can write it down. Ready to review your list of prime network contacts? Call me at 212.677.5770 or email Janet@JanetLFalk.com. Let’s polish your script, practice some calls and rev up your referrals. Click here to read prior issues of this newsletter. Word-of-mouth image courtesy of On-Hold Marketing. Thanks to David A. Fields, whose latest book, The Irresistible Consultant’s Guide to Winning Clients, provided food for thought. This entry was posted in Marketing, Newsletters and tagged marketing on August 6, 2018 by Janet L. Falk.